Last night I sweet-talked Jonathan enough he pulled out the tomatoes, watermelon, and cucumbers. After finding my last remaining watermelons bored out and hollowed by some ugly, four-legged animal, it was time. And I wasn't sad about it at all. (Edit - Maybe the tomatoes...) We planned on tilling it up and replenishing the compost this evening, but we woke up to rain, rain and more rain. The one day this summer we needed to work in dry soil, it comes down in buckets. :) But I suppose I won't complain about putting the work off a day or two. Let it rain! This early morning moment is the only time Owen slept today. The rest of the day he was only content if he was either on my hip or in my baby carrier, while I was on my feet, pacing the kitchen. Teething, growing, or just plain mean? Hard to tell. :) But he's finally settling down now. Peace and quiet, indeed. Finally! The family has eaten from every crop planted on the Bauer Farm this spring. 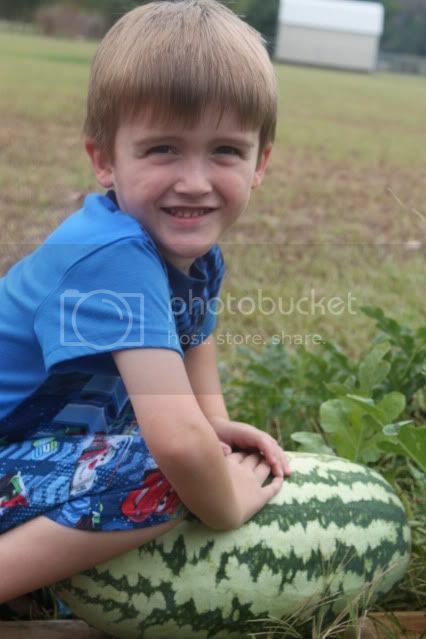 We plucked our trusty watermelon from its home next to a bed of overgrown vines. 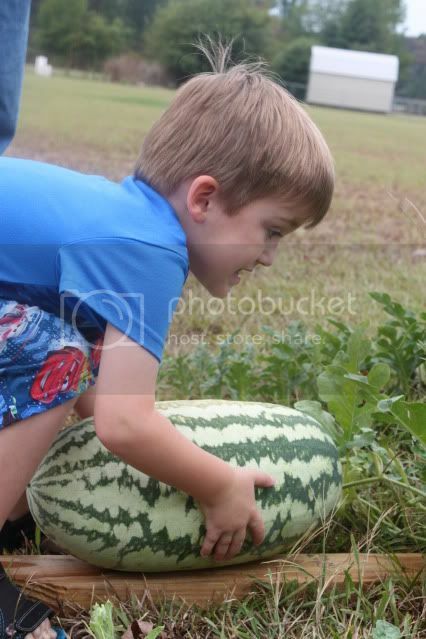 Nathan had the honor of snipping the 18-pounder, but could not carry it to the house. I had no trouble, as I tote a baby who actually has a few ounces on the melon. :) After bringing it in, we stood in anticipation as Jonathan sliced into it. I was amazed that it looked and smelled authentic. I'm not sure what I expected, but it was fantastic. When I first put this tiny plant into the ground, I said I'd be impressed if one melon even set. 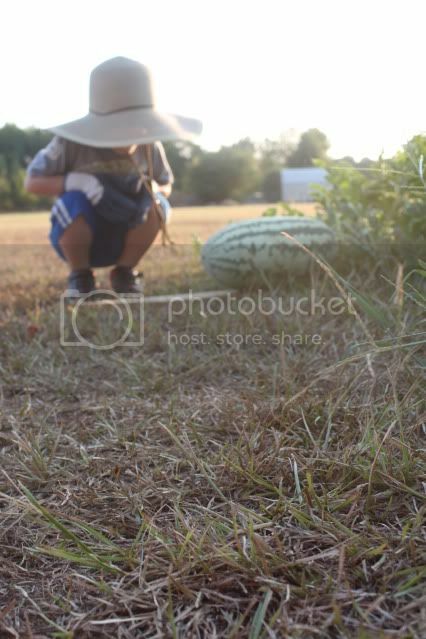 Since then, we defeated squash bugs, a drought, and one sneaky armadillo. Even though the watermelon harvest rests at one, I count this as a tremendous success. Happy harvesting and happy Monday! All it takes is a squeal, a smile, or a loving look from those brown eyes to make me realize how lucky I am. Just a few moments after this photo, a little boy burst through the door with his lunch box and gave me a big squeeze. This is one mama who realizes what she has. I'm as proud as I am thankful. No tears on the first day for this guy. Monday morning Nathan hopped out of bed, slipped his backpack onto his little body, grabbed his expertly packed Toy Story lunchbox, and retreated to the backyard for a photo op. Mom, if I smile just one time, can we please go to school?! It was Nathan's first day of preschool. Real preschool. The final year to prepare for kindergarden. And he was ready. We attended his open house last week and he had a blast. He was happy to talk to his teacher, reconnect with friends, and explore the centers, stocked with everything from moon sand to puppets. Then he shopped the Wal-Mart aisles with a smile on his face, picking a fresh box of crayons and a sharp pair of scissors. After day one, he could recite the week's memory verse and tell me the vowel sounds. He shared tales of swinging, Duck, Duck, Goose, balloon animals, and a completely devoured PBJ. He told me he was ready to go back. I've always loved school and I am so proud to see the same seems to be true for Nathan. He had a fantatic last first day of preschool. When the time comes to graduate to a whole new level of learning, I know he will be ready. On the other hand, I'm going to need a little work. :) Welcome back to school, y'all! Today my tiny little baby turned five months old. I'd be a liar if I said the first few colicky weeks flew by; however, I have no idea where months 2-5 went. 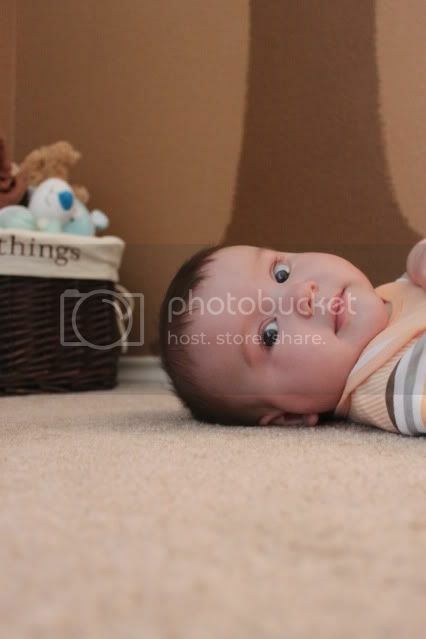 Because of the speed with which babies grow, I thought I'd remind you of his cuteness. 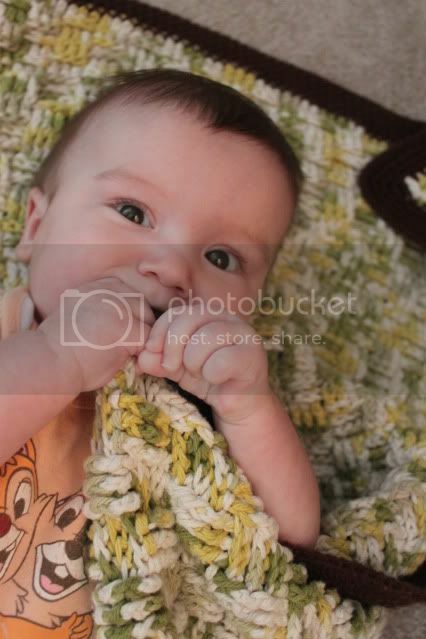 :) As of yesterday, Owen has two teeth. He officially smashed Nathan's record for early teething. Other tricks include rolling from front to back like a champ, holding up his big noggin, and laughing at everything I do - a Bauer boy requirement, as you know. I'm not exactly sure of his weight, but by the way he fills out his size 3 dipes, I'd bet he's past 18 pounds. Who knows what amazing milestones he will reach next (fingers crossed crawling is months away...), so I'm cherishing this tiny step in his life. These baby days go away too quickly, so I take time to stop and smell the roses - dirty diapers and all. Happy Wednesday! 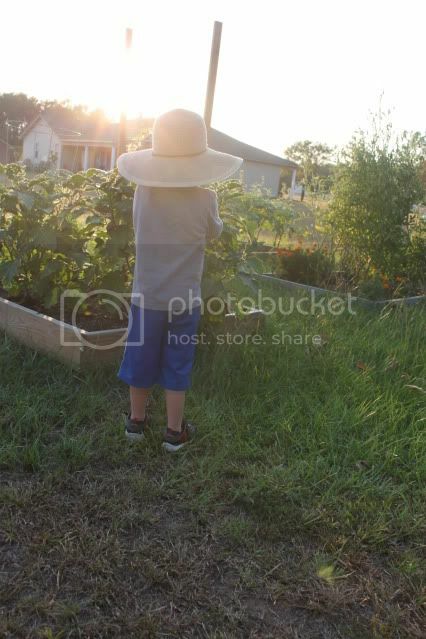 Okay Mommy, on today's garden check, I am going to be the gardener. That means I get to wear the big hat and gloves. Oh! And pick the tomatoes. I know, two garden posts back to back. Nathan had too much fun helping me that it would have been a crime to leave the camera inside. I love him and I love watching him learn. Happy Tuesday! The little ones and I made a quick trip to Forrest City this week to visit with family and let Baby Owen meet his Mema. We had a great time, but it was officially too short. My cousins are spread out across the US, so it's special to have so many together at the same time. Especially at one of my favorite places. There are so many memories I have about my Mema's house, but my favorite is the lake. I spent hours there, writing, reading, and daydreaming. And I'm pumped to have a little guy to share that with! 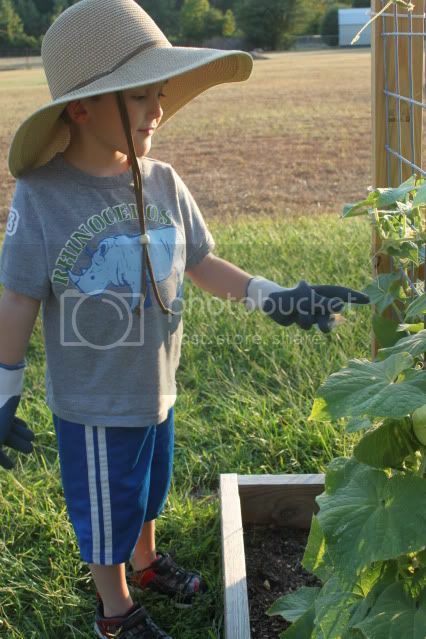 As I watched Nathan explore Mema's backyard, I saw a lot of me in him. I'd love to know what's going on inside that head, but sometimes I think I know exactly. He's too much like me. :) I hope everyone is having a fantastic week. Take a few minutes to daydream today.